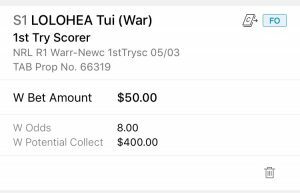 Note: I have structured the H2H bets to provide a stronger result if NEW win to offset the First Tryscorer refund we will receive if NZ win. 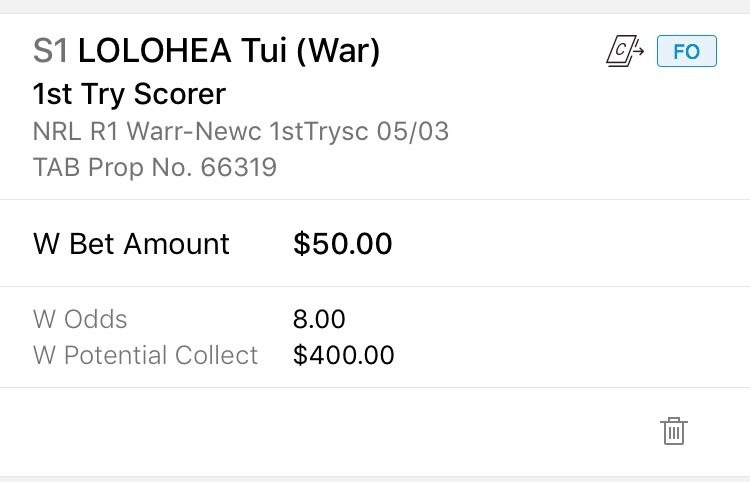 I suggest having the NEW H2H result equal $50 than that of NZ for this reason. 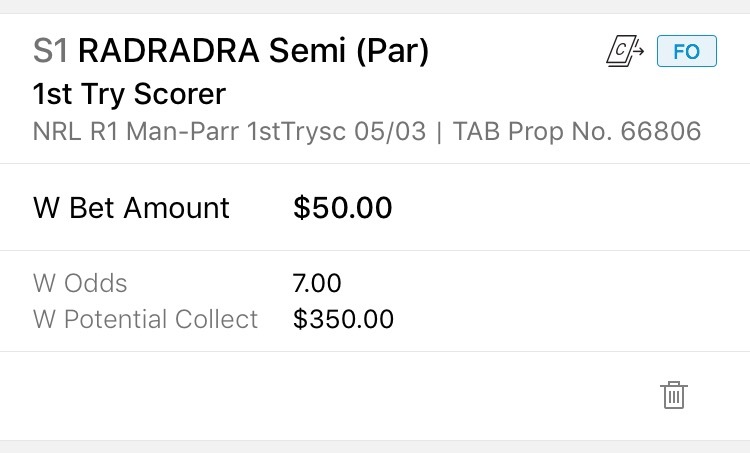 TAB: $50 Refund if your First Tryscorer loses but his team wins the match. 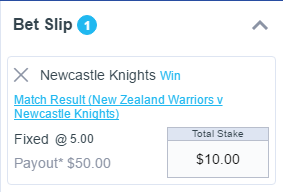 BlueBet: $10 Refund if your team lose by 6 points or less ($50 max). Sportsbet: $50FB Bonus equal to 50% of your winnings if your team wins by 6+ points. 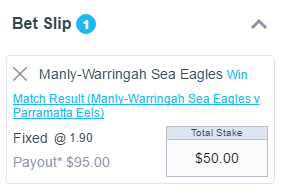 TopBetta: $50FB Bonus if your team lead at 1/2 time and lose. 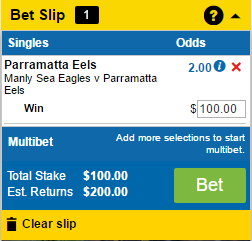 Betting.club: $50FB Bonus if your team score 4+ tries and lose. 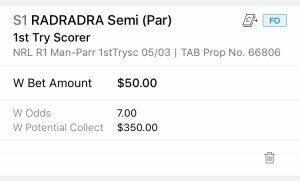 Note: I have structured the H2H bets to provide a stronger result if MAN win to offset the First Tryscorer refund we will receive if PAR win. I suggest having the MAN H2H result equal $50 than that of PAR for this reason. 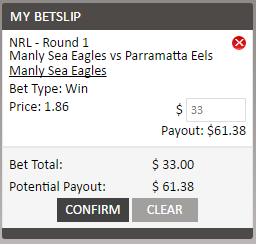 Sportsbet: $50FB Bonus equal to 50% of your winnings if your team win by 6+ points. 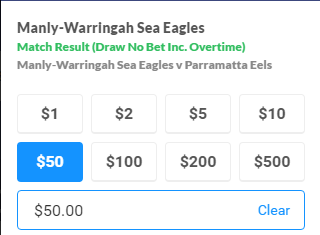 BlueBet: $50 Refund if your team lose by 6 points or less. Madbookie: $33FB Bonus if your team lose by 3 points or less ($50 max). TAB are refunding your FIXED ODDS bets as cash to $50 on Scone Race 7 if your horse runs 2nd or 3rd. William Hill are refunding your FIXED ODDS bets as a free bet up to $50 on Scone Race 7 if your horse runs in the first half of the field. William Hill are refunding your FIXED ODDS bets as a free bet up to $50 on Sha Tin Races 1-11 if your horse runs 2nd. TABtouch have a bonus SuperPick available today (in addition to your daily SuperPick) on Esperence Race 7. This includes a 50% cash bonus on your winnings up to $50. Crownbet are refunding your FIXED ODDS bets as a free bet up to $50 (5,00 rewards points) on Hong Kong Races 4-6 & Wangaratta Races 5 & 7 if your horse runs 2nd.